ANNVILLE, PA – Six Wilkes University football standouts were named to the All-Middle Atlantic Conference football teams Wednesday as announced by the conference office. Senior tight end Jeremy Hartman concluded his one year with the Colonels with a first team selection while senior cornerback Omar Richardson earned second team honors for a second consecutive year along with sophomore linebacker Tanner Stengel and junior corner Marcus Leaf. Senior offensive lineman Michael Litwak and junior defensive end Jason Ugwu rounded out the Wilkes honorees as Honorable Mention selections. 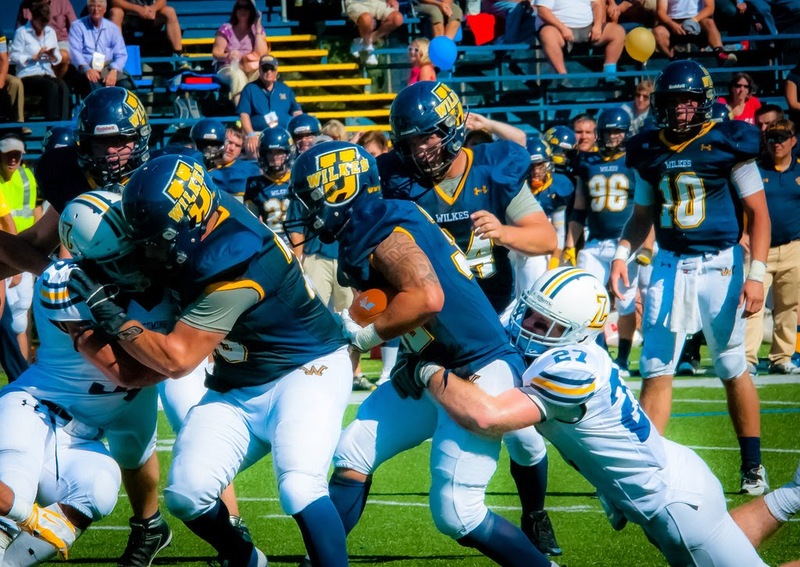 Hartman, who played for the Colonels football team for the first time since transferring to Wilkes after playing basketball for two seasons, was the top threat on the outside for Wilkes all season. He finished with 35 receptions for 492 yards and a team-high six touchdowns, ranking in the top ten in the MAC in all three receiving categories. His best two outings came against FDU-Florham when he caught six passes for a season-high 116 yards and one score and against Albright when he hauled in six passes and scored a season-best three times including a late game-tying touchdown catch. Stengel showed his promise on the Colonels defense finishing the season as the league’s top tackler with 102 total stops in ten games played. He averaged over 10.2 tackles per-game recording 10.0 tackles-for-loss and 3.0 sacks from his linebacker position. He finished the season with four straight double-digit tackle games including a career-high 15 tackles against Albright in week eight. Stengel posted at least six stops in every game this season. Richardson and Leaf combined to create one of the best one-two corner tandems in the MAC. Richardson, who was named to the second team All-MAC last season, finished with 35 tackles and was tied for the team-lead with three interceptions. Leaf posted 34 tackles, 31 solo stops, while breaking up a league-best nine passes often drawing the opponents best offensive threat on the outside. Litwak was a steady force on the Wilkes offensive line all season playing and starting in nine of the Colonels ten contests at right guard. He helped lead a Colonel offense that averaged over 333.1 yards per-game notching 32 touchdowns (17 rushing/15 passing) while scoring 22.4 points per-contest. Ugwu earned his second Honorable Mention nod finishing his junior season with 31 tackles including nine coming for a loss. He also caused havoc for opposing quarterbacks posting four sacks while forcing and recovering one fumble in ten games played. Wilkes finished the season with a 2-8 overall record going 2-7 in MAC games.